While city streets comprise large amounts or public land, many of our streets today privilege the private automobile. As new transportation modes are introduced in cities, there is a potential for new, more efficient, more valuable and more equitable configuration models for this public land. This exhibition is a mock-up of a series of ideas for a future Broadway, in which the street functions as social public space, privileging the pedestrian experience. It will be on Broadway, between 19th and 20th Streets, and is sponsored by the New York chapter of the American Institute of Architects (AIANY), New York Chapter of the American Society of Landscape Architects (ASLA-NY), the New York Chapter of the American Planning Association (APA-NY). “Future Streets” will engage Car-Free Earth Day participants in an immersive experience focused on public right-of-way design. 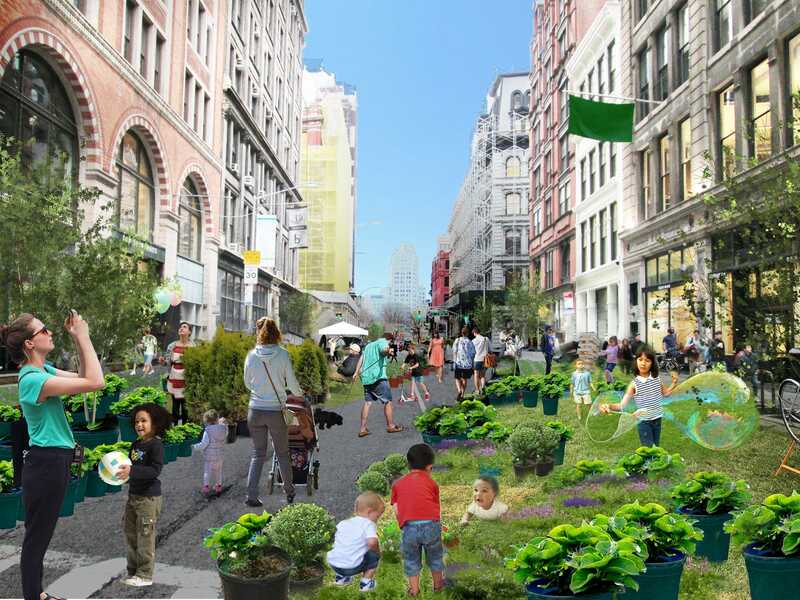 The design will feature temporary potted plantings on Broadway’s surface between 18th and 19th Streets; an engagement booth with exhibition boards illustrating potential street designs and precedent images from around the world, places for musicians to entertain, as well as moveable tables and chairs open to the public, and grassy play areas. These Car-Free Earth Day conversations will contribute to an on-going programming series our group is spearheading at the AIA’s Center for Architecture about the future of New York’s streets.